Every year, the mud festival draws thousands of visitors to the city of Boryeong. 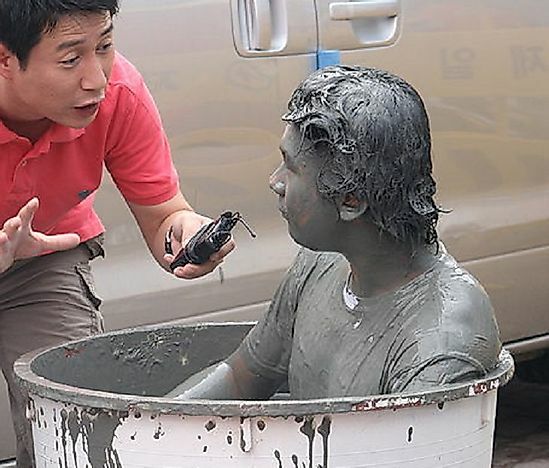 A man takes a mud bath during the 2008 edition of the Boryeong Mud Festival. A festival of pure fun and entertainment, the Boryeong Mud Festival is celebrated each year during summer in South Korea. The city of Boryeong, located on the coast of the Yellow Sea, in the South Chungcheong province of the country, serves as the venue of the festival. As the name implies, the primary event of the festival involves playing with mud that is obtained from the Boryeong mud flats. The mud from this area is believed to be rich in mineral composition and is also associated with myriad health benefits. The unique festival was first popularized by a cosmetic company in 1998, and today draws thousands upon thousands of visitors to Boryeong each year. The Boryeong Mud Festival has a short history, originating in the latter half of the 20th Century. In 1996, a Korean cosmetic company was busy making cosmetics utilizing the rich minerals, germaniums, and bentonites available in the mud of the Boryeong mud flats. The Boryeong Mud Festival was the brainchild of this company who initiated the festival to promote their cosmetic products among the masses. The festival soon started attracting Koreans as well as westerners from other parts of the world. Soon, American military forces posted in the area also started taking an interest in the festival. In the matter of a few years, the Boryeong Mud Festival started receiving huge media attention and became a national attraction in South Korea. By 2007, over 2.2 million visitors had visited Boryeong to participate in the festival. During the Boryeong Mud Festival, the entire seafront of Boryeong is decked up with arrangements like mud baths, mud slides, and mud prisons to allow people to wallow, swim, and splash in the special mud of the region. Stages are constructed to host music and dance competitions and other entertainment events. Mud skiing competitions are also held here. Shops are set up along the beach selling cosmetics that utilize the mud of Boryeong. Body painting events using colored mud is also a popular activity among the visitors. Spa, acupuncture, and beauty treatments utilizing the Boryeong mud are also offered at the festival venue. Activities like wrestling in the mud, mud sliding, and swimming in the mud pools, are the most popular ones among visitors. Those who want something more demanding can also opt for the marine mud-training course. People of all ages are welcome to the festival with special arrangements, such as special kids' mud pools being created to make the children feel like a larger part of the festival. A spectacular fireworks display concludes this two-week long summer event. The highest tourist footfall occurs during the second week of the festival which usually coincides with the second weekend in July. Nearby attractions in Boryeong include the Seongjusan National Forest, accessible by bus or car from Boryeong. Here visitors are able to hike along the hiking trail from the parking lot to the top of Mt. Seongjusan. A number of Korean temples can also be accessed from Boryeong offering visitors an insight into Korean culture, religion, and local beliefs. Several islands are also accessible by boat rides from the beach at Boryeong which carries tourists to the islands to enjoy the natural beauty of such places on day trips.